Links to this page can be found in Book 5, Map C3, Day 5, View C10 and Rione Ripa. In the 1740s Giuseppe Vasi published Vedute di Roma sul Tevere, his first book of etchings which included fifteen views of the river; while in general the works by Vasi show a lot of attention to the details of the monuments of Rome, his early engravings are more similar to landscape paintings. 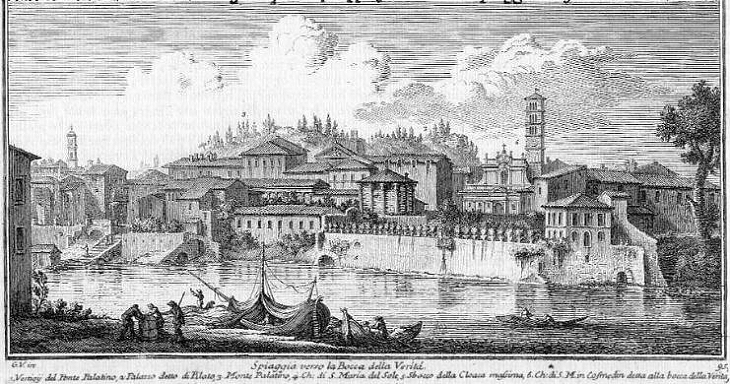 In 1754 some views from Vedute di Roma sul Tevere, including that shown above, were re-used for Book 5 which covered the same subject in addition to the bridges of Rome. The plate shows Velabro, the strip of land between the Tiber and the Palatine Hill, but it is named after Bocca della Verità, a round relief portraying a human face with an open mouth which is situated in the portico of S. Maria in Cosmedin. The view is taken from the green dot in the small 1748 map here below. In the description below the plate Vasi made reference to: 1) Ruin of Ponte Palatino (better known as Ponte Emilio or Ponte Rotto); 2) Palazzo di Pilato; 3) Monte Palatino; 4) S. Maria del Sole (Tempio di Vesta); 5) Discharge point of Cloaca Massima; 6) S. Maria in Cosmedin aka Bocca della Verità. The small map shows also: 7) Casa dei Pierleoni (and the lost church of S. Aniano). 1), 2), 3), 4) and 6) are shown in detail in other pages. The view is quite different owing to the high walls on the river bank which were built in the 1880s to prevent floods. They hide most of the monuments shown in the plate. Rome was founded on the Palatine and then it expanded on the Capitoline hill which became the religious centre of the city; the area between the two hills where later on the Romans built their Forum was subject to becoming marshy; according to tradition at the time of King Tarquin the Elder the Romans built Cloaca Massima, a sewer which received the excess water from a system of drains and discharged it into the river. Cloaca Massima was modified many times and what we see today is a conduit of the IInd century BC. A man sallied forth from the neighbouring shades with an enormous key and whispered the soul-stirring name of the "Cloca Maxima". I joyfully assented and he led me apart under a series of half-buried arches into a deeper hollow, where the great mouth of a tunnel seemed to brood over the scene and thence introduced me into a little covered enclosure, whence we might survey a small section of the ancient sewer. It gave me the deepest and grimmest impression of antiquity I have ever received. He lit a long torch and plunged it down into the blackness. It threw a red glare on a mass of dead black travertine and I was assured that I was gazing upon the masonry of Tarquinius Priscus. If it wasn't I'm sure it ought to have been. Henry James in an 1869 letter to his mother. He accessed Cloaca Massima from a former paper mill near S. Giorgio al Velabro. Read other Roman comments by Henry James. The architect and archaeologist Antonio Munoz (1884-1960) played an important role in the design of the "imperial" perspectives which in the 1930s isolated some of the most imposing monuments of Ancient Rome. He supervised the opening of Via del Mare which led to the loss of Piazza Montanara and Ospizio di S. Galla and to the redesign of the area near S. Maria in Cosmedin. 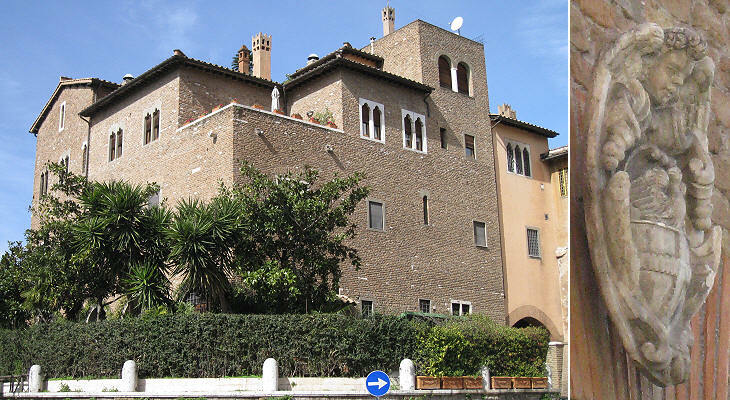 Munoz set his residence in a medieval house which had belonged to the Pierleoni, opposite Tempio di Vesta. The house was actually pulled down and rebuilt, but the frames of the small windows come from the old building. Although Munoz disliked baroque art, he decorated the entrance to his house with a coat of arms of that period. 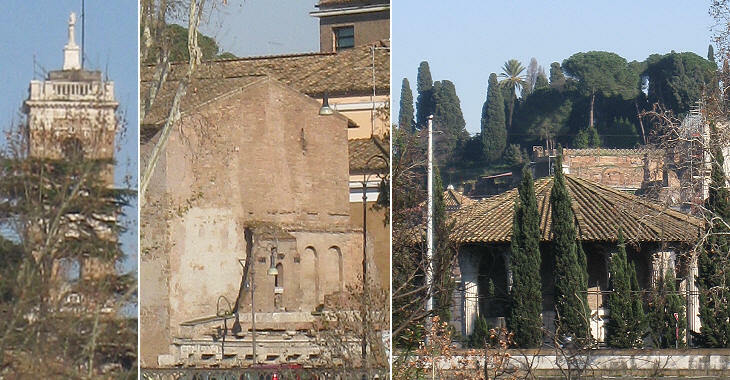 The small church of S. Aniano (now lost) was located near this house. It belonged to the guild of the cobblers and it was dedicated to St. Agnan of Orleans, who was their patron saint. You may wish to see a directory of churches belonging to a guild. Next plate in Book V: Monte Aventino e Vestigi del Ponte Sublicio. Next step in Day 5 itinerary: Anticaglie presso il Ponte Palatino. Next step in your tour of Rione Ripa: Anticaglie presso il Ponte Palatino.